Far from being a simple arrangement, this robust mix of classic and playful blooms send sincere, heartfelt sentiments reserved for close friends or loved ones. 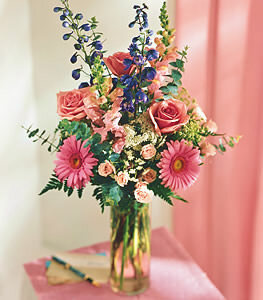 Arranged in a glass vase, pink roses and pink gerber daisies share the stage with pink snapdragons, pink spray roses, and blue delphinium. A splendid assortment that is perfect for any occasion.